For the past few of months I have been working on a new project (none gaming related), which explains the lack of updates between July and now. Thankfully that other project has since settled down a little, allowing me put some focus back onto game development. I recently purchased Gamemaker Studio 1.4 from Humble Bundle and decided to give it a try. Starting off fresh on a new SDK is tough and I struggled at the beginning. As always, going through the tutorials is the easy the part. The hard part is when you try to implement your own gameplay elements into your game. To be honest, there were times I wanted to just give up and go back to things I’m familiar with but thankfully I managed to hang on and continued working on it. I don’t have much to show at the moment but it’s basically another twist to the defense game genre. Hoping to get this up and running around next month November. Here’s a very early screenshot of the game with placeholder graphics. 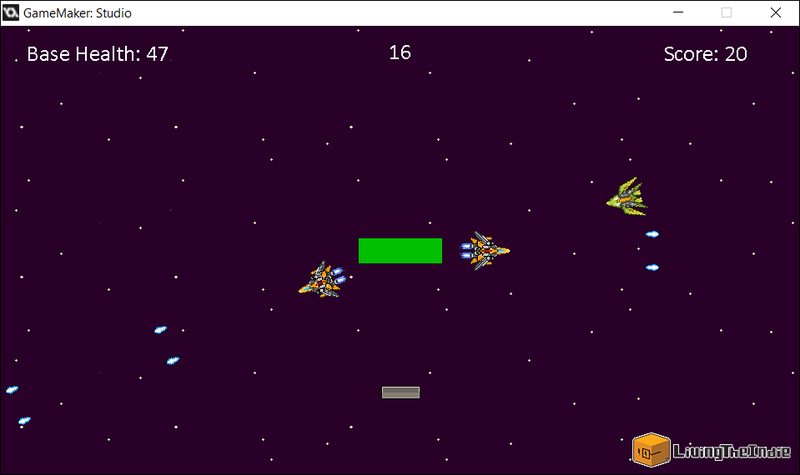 On another note, I have also uploaded my previous game DefOp: Codename I.R.I.S Dual Blaster on this site. It was originally submitted to Scirra Arcade (the folks that made Construct2 ) with over 4000 plays, which is pretty awesome. Check it out if you are interested. For the past week I have been working on bringing new updates for this game. Unfortunately, I coded the game in such a terrible way that it was impossible to add new things without revamping most of the original source code. The poor coding comes as a no surprise considering the game’s code was based on a top-down shooter prototype I made back in 2015. My philosophy at the time was “As long as it works … heck care”. I spend the last couple of days cleaning and optimizing as much as I can but from the looks of it, it’s still going to take a while. I need to learn how to code in such a way that I can easily expand the game without breaking other parts. To do that, I will either play around with the codes for Ninjas Don’t Fall or start fresh with an entirely new game. The game at its current stage does feel kinda boring in my opinion. I do have a couple of ideas in mind on how to make the game a bit more challenging. Will get to that once I solve the problems mentioned above. I recently released my very first sprite kit over at GameDevMarket, Itch.io and Scirra Market. It’s similar to the ones seen in I.R.I.S – DefOp but with more parts, including some that have not been used in the game. Do check it out if you are thinking of making 2D futuristic style games. By the way, more parts will be added soon to this kit. Been drafting quite a number of designs on paper. There are plans on releasing new sprites in the coming future. Nothing is concrete at the moment but I’m leaning towards a pirate theme. Will see how it goes. I have to admit. I’ve started tons of blogs in the past but none really lasted long except for NoCommand. Lack of motivation and the process of coming out with the ‘Perfect’ blog post are the two main factors as to why most of them never pulled through. Heck, my last post on this site was over 6 months ago. That goes to show how ‘committed’ I was in keeping things alive. Then a couple of days ago, I came across a blog post from Dale Rodgers titled “Bloggers, You Don’t Need To Get It Right, You Just Need To Get It Going..”. I will put a link at the end but long story short, reading what Rodgers wrote made me realised that I need to stop thinking too much and just get on putting contents on this site. It doesn’t have to be perfect nor does it have to be 10 pages long. The key point is to be consistent. And that is the first thing I’m going to change, my own attitude. The next thing I’ve added is webcomics. I will be putting in some effort in making webcomics related to games and indie game developments (base on my own experiences). Yes, I do realise that there are plenty of game related webcomics on the internet but this is more for my own personal gain which is to improve my drawing skills. Back in May 2015 I made a post about Project Wings and pre-maturely declared that the game will be out by June of the same year. At the time, I was pretty satisfied with what I have done. However as development progresses on, I realised that the game isn’t ‘fun’. It was just a simple endless top-down shooter with enemy planes coming in from the top or from the sides. There was no variation to the enemies movements, no cool boss fights, no interesting enemy projectiles. Stale would be the best word to describe it. Since then, a lot of has changed on Project Wings. Codes have been optimized, there are more enemy variations, and I have added boss fights. Unfortunately due to time constraints there will only be one stage at the time of release. I will talk about it on a later post. Well I guess that’s about it for now. As promised, below is the link for the blog post I mentioned earlier. Bloggers who are just starting out, you should definitely give it a read.